Indiana University basketball has long been blessed through the years with great big men. - In the early years, Branch McCracken revolutionized post play by playing with his back to the basket. - Decades later, there was Steve Downing of the 1973 Final Four team. - The Big Red Head from New Castle, Kent Benson, of the undefeated 1976 NCAA Championship team. - The dynamic duo of Ray Tolbert and Landon Turner from the 1981 champs. - In 1987, California transplant Dean Garrett manned the center position. - Millennials would point to the Big Handsome Cody Zeller of the 2013 Big Ten Championship squad. There have been many others of course, but never in the history of Indiana basketball and rarely in college basketball history has one school had a run of big men like Indiana from 1950 to 1961. That, in my opinion, was the golden age of Indiana big men. It would begin with the 1950-51 season when 6’2” Bill Garrett would win All-American honors. Now, of course, at 6’2” Garrett would not be considered a big man by today's standards. However, Garrett manned the post like few in 1951. He became the first African-American regular basketball player in Big Ten history. His senior year, he led the Hoosiers to a 19-3 record, while helping place Indiana 2nd in the Big Ten and 7th in the nation according to the Associated Press. Bill Garrett would graduate as Indiana's all-time leading scorer with 792 points. He would be the last of the great 6’2” centers. Coach McCracken pictured with Bill Garrett. 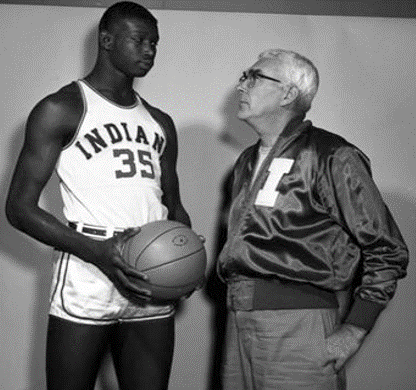 Bill Garrett’s departure paved the way for 6’10” Don Schlundt of South Bend, IN. Schlundt became Indiana's first 3x All American. Big Don would lead the Hoosiers to two Big Ten championships and IU’s second NCAA title in 1953. 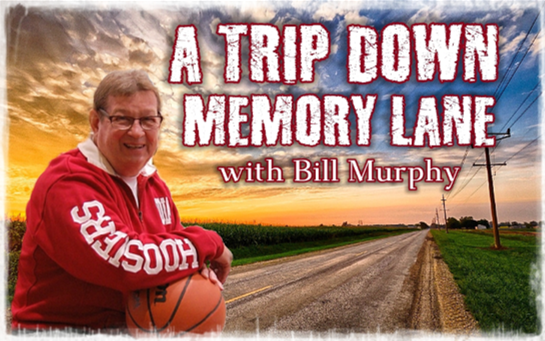 He would depart Indiana in 1955 as not only Indiana’s all-time leading scorer, but the Big Ten’s all-time leading scorer as well with 2,132 career points. In his last game, Schlundt led Indiana to a victory over Ohio State tying his career high of 47 points while setting a Big Ten record by going 25-of-30 from the free throw line. How dominant was Schlundt? He would go on to lead the Big Ten in scoring in his last three seasons. Not an easy feat. As Don Schlundt stepped aside, Mount Carmel native Archie Dees was next in line. Archie would lead Indiana to 2 Big Ten championships in 1957 and 1958 scoring at a 25-point clip his junior year and 25.5 ppg average his senior year. He would go on to become the first player ever in Big Ten history to win the MVP award for 2 straight years. Archie Dees became 2x All American and finished his career at Indiana strong with 4-straight 30-point games and averaged 28.8 ppg in his last 5 Big Ten games. The fourth in the line of great Indiana centers was the Big Bell, Walt Bellamy. Walt averaged 17.4 ppg and 15.2 rpg as a sophomore. His junior year, he increased his production to 22.4 ppg and 13.5 rpg while leading the Hoosiers to a 20-4 record winning their last 12 games including beating eventual NCAA national champions Ohio State by 16 points in the second to last game of the season. IU would finish 7th in the nation that year. His senior year, Big Bell averaged 21.8 ppg and 17.8 rpg, including setting a Big Ten record that still stands today - 33 rebounds in his final game to go along with 28 points in a win over Michigan. Walt was a 3x Indiana MVP, an All-American, and represented the Indiana Hoosiers on the 1960 Olympic team who are considered to be the greatest amateur team of all-time. The decade would see all four Indiana centers garner All-American honors and pioneer several firsts along the way. - Bill Garrett would become the third ever African American selected in the NBA draft when he was taken by the Boston Celtics. Unfortunately, he would be unable to play for the Celtics due to his time in the armed forces. Upon his return, he was cut by Boston. He would then join the Harlem Globetrotters. Garrett would finish his career coaching Indianapolis Cripus Attucks to the 1959 high school state championship becoming the first man to both play and coach a state championship team. - Don Schlundt was picked by Syracuse in the second round of the 1955 NBA draft. He would forgo playing in the NBA, because he was married and knew he could make more money for his family by selling insurance. Editor’s Note: During this time, there were only 9 NBA teams and my how times have changed in regard to making money playing professionally. - Archie Dees was selected by the Cincinnati Royals with the second overall pick in the 1958 NBA draft. His career included stops in Cincinnati, Detroit, Chicago, and St. Louis. He would go on to average 8.1 ppg and 4.8 rpg in a career beset with injuries. Archie would join Don Schlundt and his Bloomington-based insurance agency to form the tallest agency ever. - Walt Bellamy would go on to become the first Indiana Hoosier ever taken #1 in the NBA draft. He was named NBA Rookie of the Year after averaging 31.6 ppg and 19 rpg. Totals surpassed only one time by the great Wilt Chamberlain. Big Bell aged for 7 NBA teams becoming only one of eight players to score over 20,000 points and collect 14,000 rebounds. He would go on to be inducted into the basketball Hall of Fame in 1993. What a decade it was for Indiana and it's four centers! It was a decade like no other! A true golden age in the pivot!